While Tel Aviv is known around the world for its technology startups, restaurants and nightlife, art galleries and architecture, its history is often overlooked. A new interactive tourist site aims to change that, focusing on two of the most crucial events in the story of modern Israel: the birth of Tel Aviv in 1909 and the birth of Israel itself in 1948. The nearly one mile long Independence Trail takes visitors past 10 heritage sites connected by a golden path that snakes through the streets of Tel Aviv. It opened on April 18, the eve of Israel’s Independence Day, free of charge to the public. The walking trail, a joint project by the Tel Aviv-Yafo Municipality, the Ministry of Tourism and the Ministry of Jerusalem and Heritage, required several months of infrastructure work including the installation of a lighting system for nighttime visitors. “Tel Aviv, the First Hebrew City, is named after the Hebrew title of Theodor Herzl’s book Altneuland, outlining Herzl’s vision for a Jewish state in the Land of Israel. In accordance with its name, the history of Tel Aviv embodies as a microcosm of the history of Zionism and the young State of Israel,” said Minister of Heritage and Jerusalem Ze’ev Elkin. 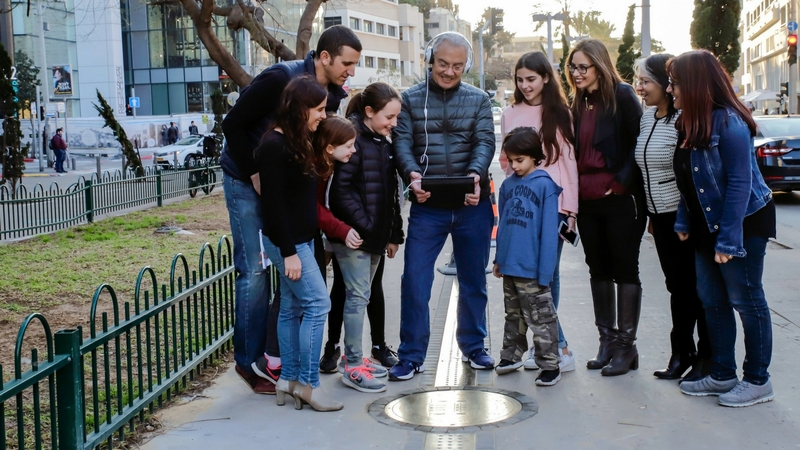 Inspired by the Freedom Trail in Boston, which takes visitors through the history of the American Revolution, the Independence Trail uses a unique mobile app to educate visitors about each of Tel Aviv’s heritage sites. At each of the 10 stops, information about the location will appear on the visitor’s device, explaining its historical context and background. Visitors can also guide themselves along the trail using a map available in eight languages: Hebrew, English, French, Spanish, German, Arabic, Chinese and Russian. The trail begins at the intersection of tree-lined Rothschild Boulevard and Herzl Street, home to Tel Aviv’s first kiosk. Established in 1910, the location quickly became a central meeting place for locals. During the 1920s, around 100 kiosks operated in the city under the association of the kiosk and soft-drink store owners. 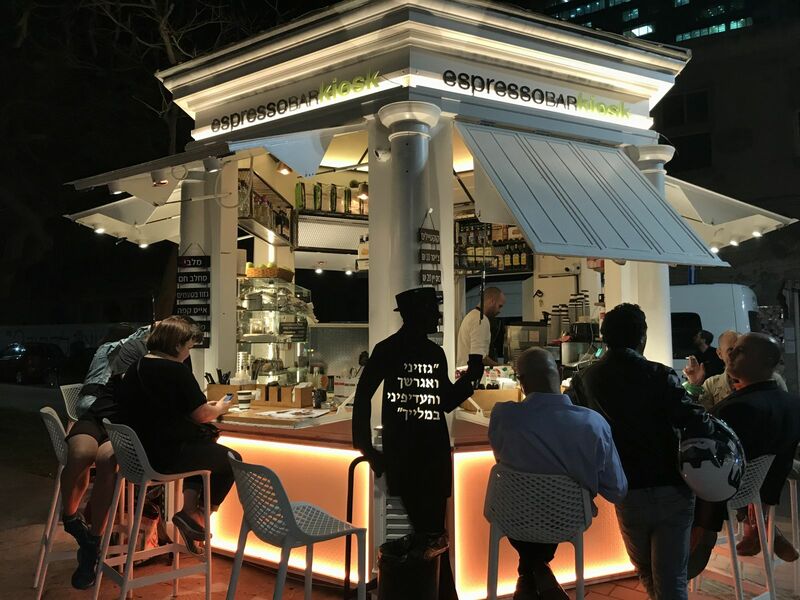 Today, the original kiosk serves as an espresso bar, centrally located among Tel Aviv’s most popular bars and restaurants. 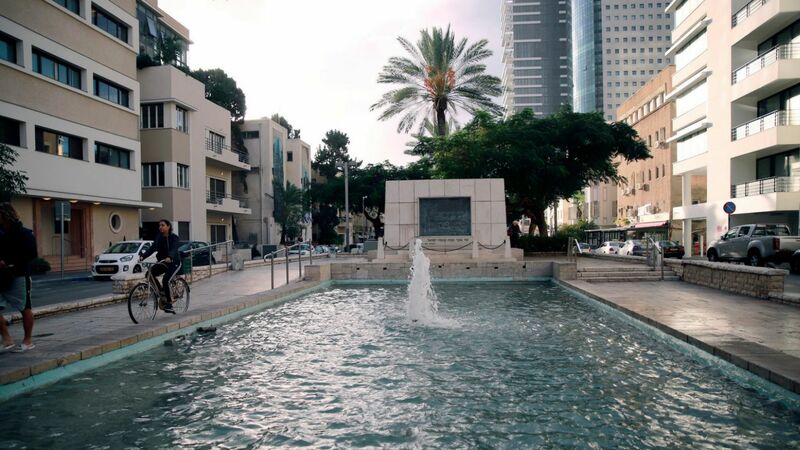 The second stop takes visitors to the Nahum Gutman Fountain, decorated with mosaics that tell the history of Jaffa – the ancient port city from which Tel Aviv was born. 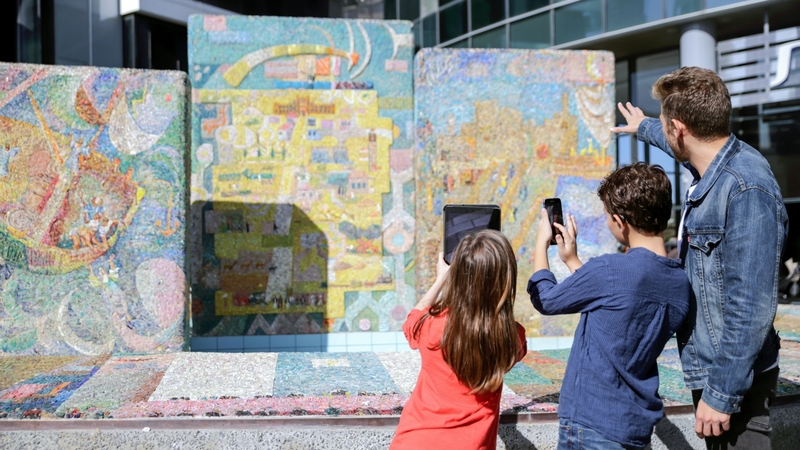 The mosaic was created by Israeli artist Nachum Gutman, who grew up in Tel Aviv along with the new city, and reflected the simplicity of the early days of the first Hebrew city. Gutman helped pioneer a distinctly Israeli style of art and was awarded the Israel Prize in 1978. The third stop on the trail is the home of Akiva Aryeh Weiss, founder of the city’s first neighborhood, Ahuzat Bayit, which later evolved into modern-day Tel Aviv. As president of the then newly established Building Society, Weiss presided over the 1909 lottery in which 66 Jewish families drew numbers written on seashells to determine the allocation of lots in the future city of Tel Aviv. From there, the trail continues to the site where the first Hebrew-speaking high school, the Herzliya Hebrew Gymnasium, once stood. 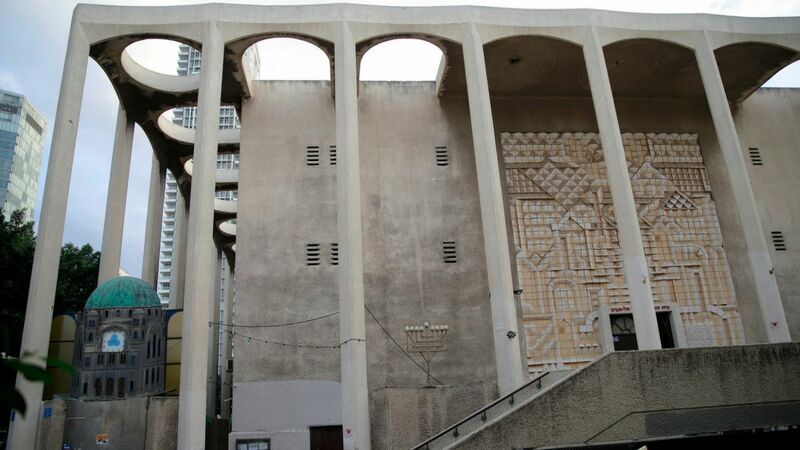 Located on Herzl Street, the building was a major Tel Aviv landmark until 1962, when the site was demolished for the construction of the Shalom Meir Tower. Today, the Shalom Tower is home to a visitors center about the history of Tel Aviv, open free to the public on weekdays. Next, visitors arrive at the Great Synagogue on Allenby Street, the spiritual and religious center of the first Hebrew city. The building features a huge dome, elaborate lighting fixtures and stained glass windows. The nearby Hagana Museum is the sixth stop on the trail, located in the former home of Eliyahu Golomb, the founder of the pre-state Jewish military force that later evolved into the Israel Defense Force (IDF). From 1930 to 1945, the building was used as Hagana’s secret headquarters. The museum will offer free public entry during 2018, in honor of Israel’s 70th anniversary. The next stop is the Bank of Israel Visitors Center. The center presents the history of the financial system in Israel and displays an extensive exhibition of banknotes and coins issued throughout pre-state days to the present. The center is also offering free public entry to mark Israel’s 70th anniversary. 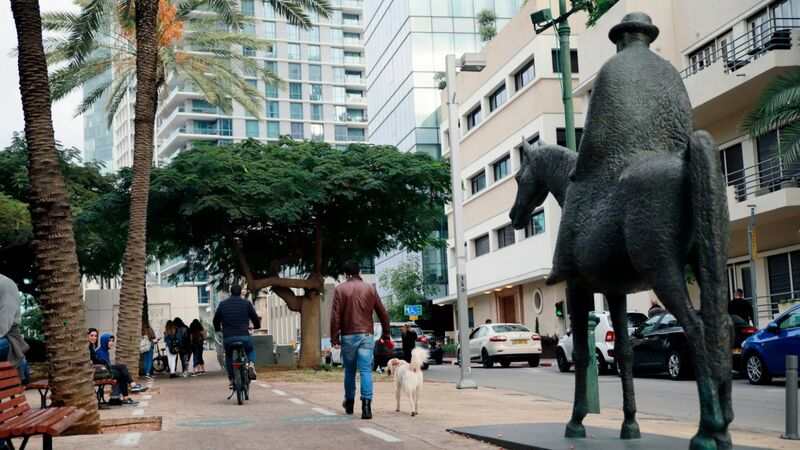 The trail then heads to the Tel Aviv Founders Monument on Rothschild Boulevard, dedicated to the men and women who established Tel Aviv in the first half of the 19th century. The trail continues at the statue of Meir Dizengoff, Tel Aviv’s first mayor. He was known for riding his horse from his home to City Hall, then located on Bialik Street. The statue was created by artist David Zondolovitz and unveiled in front of Dizengoff’s historic residence, Rothschild Boulevard 16, in 2009. The Independence Trail ends across the street at Independence Hall, where on May 14, 1948, David Ben-Gurion read aloud the Declaration of Independence as Israel was declared an independent Jewish state.